The recent election results came as a huge shock for almost everyone at South, but especially for Muslim students, who make up a significant portion of our school’s population and who contribute greatly to the diversity of our community. Most of South’s Muslim students are Somali or Oromo, but there are Muslim students of other races and nationalities as well. Throughout his campaign, President elect Donald Trump made many statements that were viewed by many as hurtful and derogatory to various groups of different people, Muslims in particular. In light of Trump’s hate speech directed specifically towards Muslims, it is important to hear what the Muslim students at South have to say in response to the election results. Many students talked about the different ways that Trump’s campaign stirred up fears about immigrants coming to the U.S.
“It’s human nature to fear what you don’t know… Trump’s campaign was beautifully crafted the way he exploited people’s fears, it’s extremely disgusting and disruptive, but that’s what his whole campaign was run on,” said junior Abdurahman Adan. Trump’s most well known statement concerning Muslims was a call for a “Total and complete shutdown of Muslims entering the United States.” He later said that he wanted to require Muslim Americans to register in a government database and carry special religious identity cards. Islamophobia has been a big problem for the past ten years, but it has become more apparent in the final months leading up to the election. According to the New York Times article “Hate Crimes Against American Muslims Most Since Post-9/11 Era,” hate crimes against Muslims have risen in conjunction with the growth of Trump’s campaign. Trump’s repeated statements connecting Muslims to ISIS and invoking more fear of ISIS has normalized the stereotype that all Muslims should be suspected as terrorists. “Prior to Trump being elected, I’ve always been Muslim, I’ve always been a woman, I’ve always been black… I feel like my struggles have always been there… but now it’s just a matter of how crystal clear it’s been… it’s more obvious than ever that I have struggles that some people just can’t relate to,” said junior Naheli Ahmed. Many students expressed that they feel their religion is misunderstood and stereotyped. “Not every Muslim is a terrorist and when a Muslim comes to the U.S. it’s not to tear the American culture down… it’s to build and bring in our culture and our perspectives to grow with the community,” said Aden. “It’s the same thing… like ISIS, they’re not Muslim, I can tell you that right off the bat” continued Ali. When you do put yourself out there to learn, it’s easy to see that Islam is a beautiful and complex religion that cannot be defined by any stereotype. “If you look into [Islam], it’s so beautiful… the peace, serenity, harmony, throughout everybody’s hearts… once we hear the Quran, once we’re praying, it’s just beautiful, and it has a lot of meaning to me,” said Ali. “[Trump] sees a single story of what [Islam] is from seeing the news, the statistics,” said Salad. “But that’s a single story, he doesn’t know my life, he doesn’t know my brother’s life, he doesn’t know my neighbor’s life… everybody comes from different places and [perspectives],” said Salad. This came as a blow to many Somali people throughout the country. “I feel like he was singling out [the Somali community] when he called us terrorists… he was trying to get everybody to turn on us,” said Salad. It is clear that the hate targeted towards minority people is a serious problem, as it has been for a very long time. 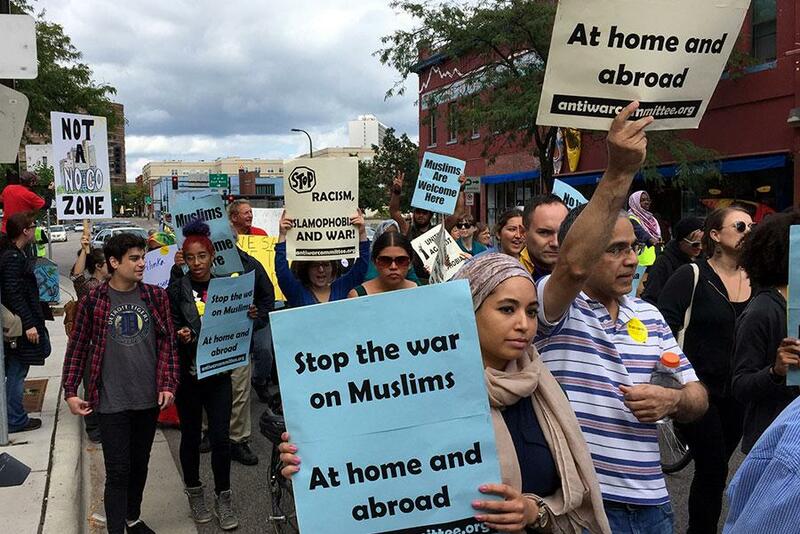 Many believe that the bigotry needs to stop, no matter who it’s directed at: immigrants, Muslims, Somali people, and people of color in general. And in light of the election, this has been even more pressing. Yet despite the reactions of fear and anger, most students believe that the Muslim and black communities will stay strong. “Even in the Muslim religion, we’ve been through worse than this… and black culture, African American history, we’ve been through stuff way worse than this… if we can handle hundreds of years of being in chains and being whipped and picking cotton, we can handle four years of [Trump],” said Ali. And even though it’s easy for liberals to get angry at Trump supporters for their choices during the election, it’s still important to remember that they are human too and that democracy requires that we respect the electoral results and those with differing viewpoints.